Home » Blog » How to Clean Up your Inbox from Annoying Emails. Have you been bothered with annoying emails from people you don’t even know? Would you like to have a clean inbox and get the right mail whenever you check your mail? I believe you will appreciate this idea, so share it with others. Due to the fact that I always receive unwanted emails in my inbox, it has made me feel reluctant to check my Gmail. What am I going to see? Irrelevant emails which I like to call annoying emails. I don’t remember the last time I checked my Gmail because of these junk mails will go and cover up the main mail I am supposed to read. So disappointing. I took it upon myself to do some research and discover how I can stop those annoying emails that flood my inbox. If this post helps you to clean your inbox, share it with your friends and save them from junk mails. It is not a good idea to run away from our mails because we have 2000 unread messages, a majority of them being Facebook, Twitter and Google+ notifications. How to Clean Up your Inbox. You can clean your inbox with ease by using this Gmail app unroll.me. If you are using Yahoo mail or Hot mail or any other mail service, I am sorry this app will not work for you. It only works on Gmail. 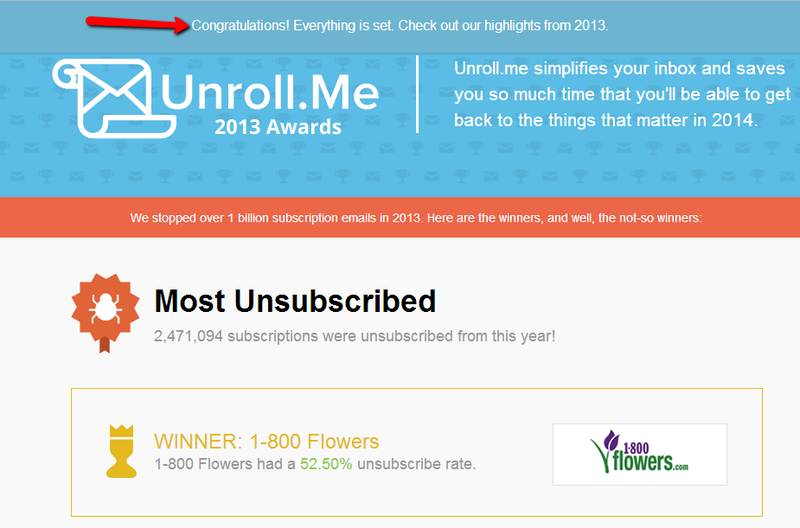 So the first step is for you to go to the website www.unroll.me. Click on the Get Started Now button. Once you click on the button, a pop-up box will appear. Enter your email address in the pop-up box. 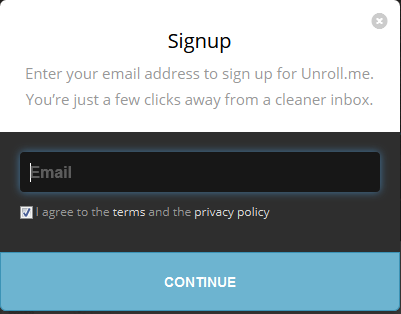 Once you enter your email address, check the checkbox to agree with the terms and condition of unroll.me, then click on CONTINUE. If you are not already logged in to Gmail, you will be redirected to Gmail login screen where you will be asked to enter your password. So enter your password and click on sign in. 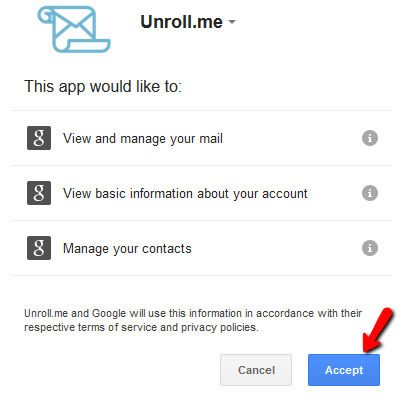 Once you login to your Gmail account, please click on accept to allow unroll.me to have access to your inbox. You will now be redirected to this page above. Click on the button CONTINUE TO THE NEXT STEP. You can also take a few seconds of your time to share this app to your friends on Facebook or twitter. You can also send an email to a friend about this app. It is not going to disturb your operation because unroll.me will automatically open a new tab for the sharing. Now, this is the most important part. 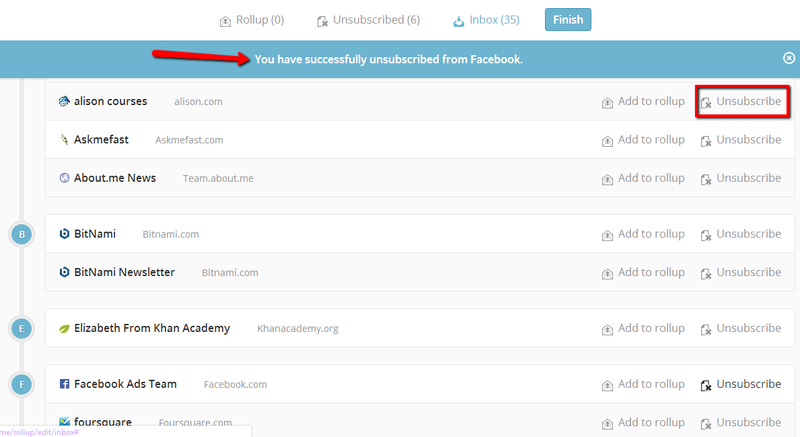 Unsubscribe from those you wouldn’t like to be receiving email updates from. This is as easy as it can get. Once you are done, click on Finish. You now have a Gmail inbox that is free from junk mails. Don’t make the same mistake twice. When you want to subscribe to any newsletter, make sure you want to read it.